Inertia Beverage Group has emerged the winner in the financial rugby scrum to snag the remains of New Vine Logistics. Observers said that IBG laid a winning body check on front-runner WTN Services Thursday when Bob Ackerman, Managing Director and Founder of Allegis Capital agreed to substantially increase his existing investment. The financial details were not available, nor any sort of new capitalization table among the many investors in both companies. New Vine alone had at least nine major rounds of funding. How the cap table and subsequent ownership percentages are finally sorted out will determine whether this is a merger or an acquisition. IBG went live on the Web on April 2, 2003, with Chameleon Cellars. Today, the IBG site lists approximately 225 wineries. 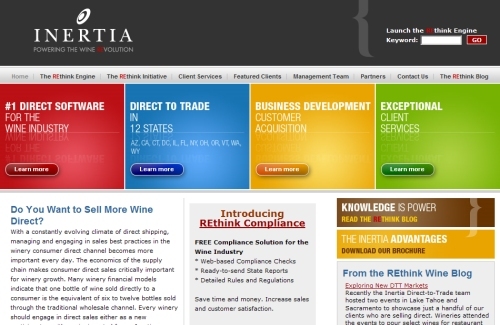 Founded by Wineshopper/wine.com veteran Paul Mabray, Inertia Beverage Group has raised $10 to $15 million since then. The largest round was an $8 million series B funding in April 2007 led by Allegis Capital and Sid R. Bass Associates. For six days, the existing investors conducted a speed-dating circus with potential suitors underneath a storm cloud of angry customers, unpaid employees and an exodus of New Vine customers. Wine Industry Insight interviewed a wide range of laid-off employees, all of whom said they had already filed complaints with the Division of Labor Standards (DLSE) Enforcement of the California Department of Industrial Relations. The Oakland DLSE office confirmed a “large number” of complaints about New Vine. Other employees said they were pooling their money and searching for a class-action labor attorney. Additional pressure was brought by the exodus of winery customers from New Vine that accelerated as vintners grew angrier and angrier about the inability to ship orders or to take possession of their wine. Amazon — with the contract rights and other ties to New Vine — was omnipresent in the proceedings. The mammoth Internet retailer had already gone “live” with a stealth version of its New Vine-based wine sales site which was being tested by those issued passwords. Those involved in that process said that only minor tweaks and content revisions remained before opening its doors to the cyber public. Wine Industry Insight had no details on Amazon’s possible role in the merger/acquisition process at the time this article was being written Thursday night. Knowledgeable sources say that the event precipitating the sudden shutdown of New Vine was a presentation by interim CEO Roy Kim who had been brought in by investors to give them an independent assessment of the company’s position. In going over New Vine’s operations, Kim, the sources say, found substantial debts that were not on the company’s balance sheet. At that time, New Vine had been operating without a Chief Financial Officer for about two years, despite the fact that the company’s financial structure and cash flows are more complicated than the average company. A formal announcement was expected to be released by the morning of June 5.